I love the cover of this book, don’y you? Makes me want to buy a white dress just so I can wear killer red heels. I read this on my Nook so, unfortunately, I don’t get to admire it on my shelves. This was a very fun, light romance. I wasn’t sure about Honoria at first, but her devotion to family and tradition won me over and provided more than a few chuckles. Marcus, the Earl of Chatteris, was easy to feel a warm spot for because of his lack of family and the way he truly appreciated the Smythe-Smith clan. The two grew up together , but it wasn’t until Honoria’s ill-conceived plan with a shovel that the two realized there was love there. The story didn’t linger and always felt fresh. 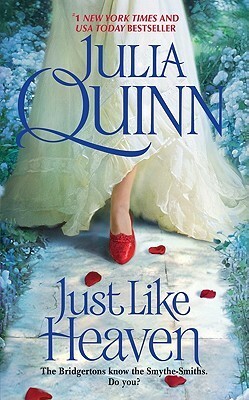 This was a very enjoyable first read of Julia Quinn’s work and I know I’ll read more. I love historical romances and this is the perfect time of year for light and happy reading. We have a QUIZ WINNER! I checked and see that I have this one in audio. I read the second in the series (for review) and found it to be a fun (and funny) read so I’ll try to get to this one soon. Glad it was a fun one! These are great this time of year! I do love the cover even though I’ve given up on killer heels. The book probably isn’t my cup of tea. I love the cover too. I have not read a single book by this author yet (*gasp) even though I can find her books easily available in the library 🙂 One of these days, I am going to read this one 🙂 Great review as always! I am not sure I’ve read Julia Quinn. I am going to have to check it out. I’ve read more HR this year than in years past! Perfect timing, I was looking for a new romance book to read. I’m drawn to the cover, and am glad to hear that the story is enjoyable as well!